Please ensure that all gymnasts are wearing gym appropriate clothing to class that allows them to move around. ​NO jeans or socks. Barefeet, dance or gymnastics slippers work best! If we hope for children to be active throughout life, we need to support them to develop physical literacy at a young age. Rhythmic gymnastics offers children the opportunity to develop the motivation, confidence, appreciation for sport, and competence in movement that supports them to be active for life. According to Gymnastics Canada, early participation in gymnastics develops the most fundamental movement skills, physical and motor abilities, mental abilities, social and emotional abilities, and performance skills that carry over into all aspects of life. The development of fundamental movement skills and motor skills is critical to establishing the foundation for participation in many sports and physical activities. A child who has not had the opportunity to develop these basic motor skills experiences difficulties or barriers when participating in sport experiences, or later school-based programs that involve more difficult skills. 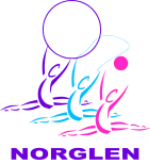 Norglen RG supports children and adults to be active throughout the lifespan by offering classes for preschoolers to seniors. Mondays 6:10 - 6:55 PM at North Glenmore Park Community Association. Although no experience is necessary, we recommend that gymnasts in this group have at least one year of rhythmic gymnastics or previous dance or gymnastics experience. This class will focus on progressing the gymnasts skill level and technique while improving flexibility and having fun. This group will have the opportunity to perform in the Winter and Spring Shows and potentially at other events within the province. All performing groups are open to new gymnasts with coach's discretion - previous dance or gymnastics experience is not necessary although it is an asset. All of our performing groups work towards improving flexibility and technical skill in a non-competitive environment. These groups perform in our Winter and Spring Shows, the Provincial Gymnastraeda, and at various other events throughout the year. * All performing group members are expected to participate in their performing group for the full year. Performing more advanced rhythmic gymnastics skills correctly and safely requires a foundation of strength, endurance, flexibility, and agility. This class will be open to all performing team members and will focus on improving body technique and preventing injury through stretching, ballet, and strength training exercises. Thursdays 6:00 - 7:00 PM at Lakeview Baptist Church. The Jeunesse Performing Team combines rhythmic gymnastics, dance and teamwork with a greater focus on performance than our introductory classes. This group will work on improving apparatus skill, body technique, and flexibility. They will work on routines for performance opportunities including our club winter and spring shows, provincial gymnaestradas, and various other events throughout the province. Note: Parent Volunteers are required for supervision of practices. New gymnasts are welcome to this group at the discretion of the coach. Previous dance or gymnastics experience is an asset. The Junior Performing Team offers an opportunity to combine dance and gymnastics with a performance focus. This group will work on improving apparatus skill, body technique, and flexibility. They will work on routines for performance opportunities including Winter and Spring Shows, Provincial Gymnaestradas, and various other events. The Senior Performing Team is open to new gymnasts. However, admittance is at the discretion of the coach. Please contact us for more information. The Senior Performing Team offers an opportunity to combine dance and gymnastics with a performance focus. The group will work on improving apparatus skill, body technique, and flexibility. They will work on routines for performance opportunities including Winter and Spring Shows, Provincial Gymnaestradas, and various other events. In the past this group has travelled to participate in provincial and national events. Thursdays 7:00 - 9:00 PM at Lakeview Baptist Church. This group focuses on challenging themselves in apparatus skills and body technique whilst having fun and keeping fit. This group is open to new gymnasts, however, admittance is at the discretion of the coach. The group will have the opportunity to perform at our annual Winter and Spring Shows as well as various other events throughout the year. This group meets for the second hour of the previous group to join in the fun with less time commitments. The ladies group's focus is towards fun and fitness in a social setting. No experience is necessary and there is no age limit! This group participates in several performances throughout the year. Many of the gymnasts are longtime members and have participated in various Provincial, National, and World Gymnaestradas. (This group is comprised of gymnasts from our performing teams. They will be working towards performing in Austria in 2019 for Worlds.